The term ‘classifying’ defines the mechanical separation of a particle spectrum suspended in a liquid into two groups. The separation is based on physical effects. 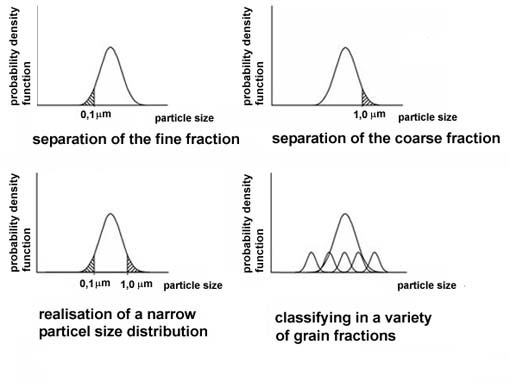 Separation of particle size distributions in the centrifugal field due to the influence of mass-related different dynamical effects. Due to its viscosity, the slurry adheres to the rotor wall and rotates at approximately the same speed. 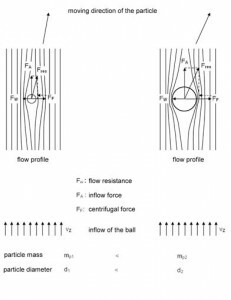 Subsequently, the liquid and the suspended solids particles are drawn by the centrifugal forces, working on them, to the classifying rotor wall and a parabolic liquid level is forming under the effect of acceleration due to gravity and centrifugal force. At increased speed, with an annular classifying rotor lid, the slurry, in borderline case, is available in form of a liquid cylinder. Here flow forces in the lower Reynolds’ number range are exerted on the solids particles suspended in the liquid, i.e. in laminar flow. All in all, the particles are therefore subjected to directed total forces diagonal to the wall, the force deflection angle α is decreasing as the volume increases, so that only the finest particles reach the top classifying rotor rim, while all others settle on the classifying rotor wall. Depending on the operation parameters of the classifying system either only the fine fractions resp. 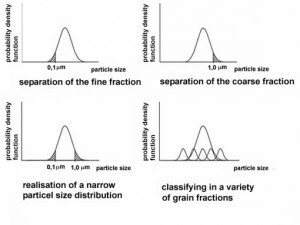 coarse fractions can be separated or also middle particle fractions can be selected, if required by application. In other words, the centrifugal separation offers the possibility to provide tailor-made, nanoscale solids particles for each specific application. Nanoscale particles are different from the behaviour of coarse particles, because the surface forces dominate against the inertial forces and gravity increasing with the particle mass and after that decisively influence the specific characteristics of the slurry. 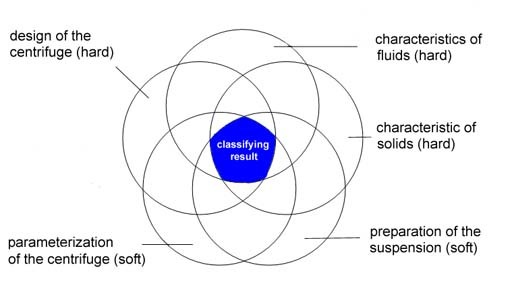 However also with low solids concentration as well Balance of centrifugal wet classifying and its influencing variablesas laminar slurry flow finest particles are also subject to the Stokes’s law. Condition is, however, that agglomeration of the particles doesn’t occur, because then the particle swarm obeys to other laws. But examination have resulted that, from a certain concentration, all particles are moving with approximately the same rate of fall. 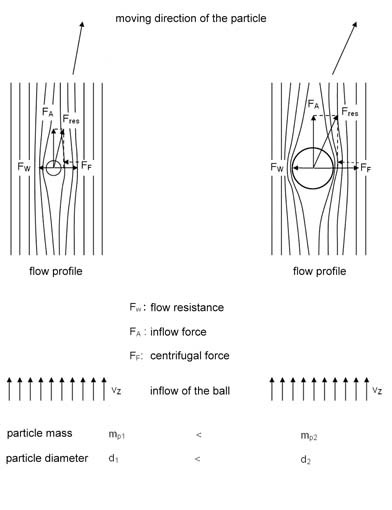 In total the behaviour in the centrifugal field of force are determined by several influence factors which are necessary to balance during the classifying.